Taiga (/ˈtaɪɡə/; Russian: тайга́, IPA: [tɐjˈɡa]; possibly of Turkic or Mongolic origin), generally referred to in North America as boreal forest or snow forest, is a biome characterized by coniferous forests consisting mostly of pines, spruces, and larches. Taiga is the world's second-largest land biome, after deserts and xeric shrublands, covering 17 million square kilometers (6.6 million sq mi) or 11.5% of the Earth's land area. The largest areas are located in Russia and Canada. The taiga is the terrestrial biome with the lowest annual average temperatures after the tundra and permanent ice caps. Extreme winter minimums in the northern taiga are typically lower than those of the tundra. The lowest reliably recorded temperatures in the Northern Hemisphere were recorded in the taiga of northeastern Russia. The taiga or boreal forest has a subarctic climate with very large temperature range between seasons, but the long and cold winter is the dominant feature. This climate is classified as Dfc, Dwc, Dsc, Dfd and Dwd in the Köppen climate classification scheme, meaning that the short summer (24 h average 10 °C (50 °F) or more) lasts 1–3 months and always less than 4 months. In Siberian taiga the average temperature of the coldest month is between −6 °C (21 °F) and −50 °C (−58 °F). There are also some much smaller areas grading towards the oceanic Cfc climate with milder winters, whilst the extreme south and (in Eurasia) west of the taiga reaches into humid continental climates (Dfb, Dwb) with longer summers. The mean annual temperature generally varies from −5 °C to 5 °C (23 °F to 41 °F), but there are taiga areas in eastern Siberia and interior Alaska-Yukon where the mean annual reaches down to −10 °C (14 °F). According to some sources, the boreal forest grades into a temperate mixed forest when mean annual temperature reaches about 3 °C (37 °F). Discontinuous permafrost is found in areas with mean annual temperature below 0 °C, whilst in the Dfd and Dwd climate zones continuous permafrost occurs and restricts growth to very shallow-rooted trees like Siberian larch. The winters, with average temperatures below freezing, last five to seven months. Temperatures vary from −54 °C to 30 °C (−65 °F to 86 °F) throughout the whole year. The summers, while short, are generally warm and humid. In much of the taiga, −20 °C (−4 °F) would be a typical winter day temperature and 18 °C (64 °F) an average summer day. The growing season, when the vegetation in the taiga comes alive, is usually slightly longer than the climatic definition of summer as the plants of the boreal biome have a lower threshold to trigger growth. In Canada, Scandinavia and Finland, the growing season is often estimated by using the period of the year when the 24-hour average temperature is +5 °C (41 °F) or more. For the Taiga Plains in Canada, growing season varies from 80 to 150 days, and in the Taiga Shield from 100 to 140 days. Some sources claim 130 days growing season as typical for the taiga. Other sources mention that 50–100 frost-free days are characteristic. Data for locations in southwest Yukon gives 80–120 frost-free days. The closed canopy boreal forest in Kenozersky National Park near Plesetsk, Arkhangelsk Province, Russia, on average has 108 frost-free days. The longest growing season is found in the smaller areas with oceanic influences; in coastal areas of Scandinavia and Finland, the growing season of the closed boreal forest can be 145–180 days. The shortest growing season is found at the northern taiga–tundra ecotone, where the northern taiga forest no longer can grow and the tundra dominates the landscape when the growing season is down to 50–70 days, and the 24-hr average of the warmest month of the year usually is 10 °C (50 °F) or less. High latitudes mean that the sun does not rise far above the horizon, and less solar energy is received than further south. But the high latitude also ensures very long summer days, as the sun stays above the horizon nearly 20 hours each day, with only around 6 hours of daylight occurring in the dark winters, depending on latitude. The areas of the taiga inside the Arctic Circle have midnight sun in mid-summer and polar night in mid-winter. Lakes and other water bodies are common in the taiga. The Helvetinjärvi National Park, Finland, situated in the closed canopy taiga (mid-boreal to south-boreal) with mean annual temperature of 4 °C (39 °F). The taiga experiences relatively low precipitation throughout the year (generally 200–750 mm annually, 1,000 mm in some areas), primarily as rain during the summer months, but also as fog and snow. This fog, especially predominant in low-lying areas during and after the thawing of frozen Arctic seas, means that sunshine is not abundant in the taiga even during the long summer days. As evaporation is consequently low for most of the year, precipitation exceeds evaporation, and is sufficient to sustain the dense vegetation growth. Snow may remain on the ground for as long as nine months in the northernmost extensions of the taiga ecozone. In general, taiga grows to the south of the 10 °C July isotherm, but occasionally as far north as the 9 °C (48 °F) July isotherm. Rich in spruces, Scots pines in the western Siberian plain, the taiga is dominated by larch in Eastern Siberia, before returning to its original floristic richness on the Pacific shores. Two deciduous trees mingle throughout southern Siberia: birch and Populus tremula. In Sweden the taiga is associated with the Norrland terrain. Taiga soil tends to be young and poor in nutrients. It lacks the deep, organically enriched profile present in temperate deciduous forests. The thinness of the soil is due largely to the cold, which hinders the development of soil and the ease with which plants can use its nutrients. Fallen leaves and moss can remain on the forest floor for a long time in the cool, moist climate, which limits their organic contribution to the soil; acids from evergreen needles further leach the soil, creating spodosol, also known as podzol. Since the soil is acidic due to the falling pine needles, the forest floor has only lichens and some mosses growing on it. In clearings in the forest and in areas with more boreal deciduous trees, there are more herbs and berries growing. Diversity of soil organisms in the boreal forest is high, comparable to the tropical rainforest. There are two major types of taiga. 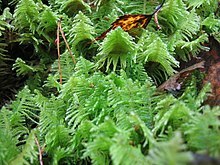 The southern part is the closed canopy forest, consisting of many closely spaced trees with mossy ground cover. In clearings in the forest, shrubs and wildflowers are common, such as the fireweed. The other type is the lichen woodland or sparse taiga, with trees that are farther-spaced and lichen ground cover; the latter is common in the northernmost taiga. 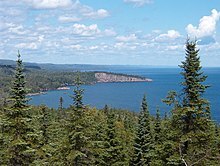 In the northernmost taiga the forest cover is not only more sparse, but often stunted in growth form; moreover, ice pruned asymmetric black spruce (in North America) are often seen, with diminished foliage on the windward side. In Canada, Scandinavia and Finland, the boreal forest is usually divided into three subzones: The high boreal (north boreal) or taiga zone; the middle boreal (closed forest); and the southern boreal, a closed canopy boreal forest with some scattered temperate deciduous trees among the conifers, such as maple, elm and oak. This southern boreal forest experiences the longest and warmest growing season of the biome, and in some regions (including Scandinavia, Finland and western Russia) this subzone is commonly used for agricultural purposes. The boreal forest is home to many types of berries; some are confined to the southern and middle closed boreal forest (such as wild strawberry and partridgeberry); others grow in most areas of the taiga (such as cranberry and cloudberry), and some can grow in both the taiga and the low arctic (southern part of) tundra (such as bilberry, bunchberry and lingonberry). Evergreen species in the taiga (spruce, fir, and pine) have a number of adaptations specifically for survival in harsh taiga winters, although larch, which is extremely cold-tolerant, is deciduous. Taiga trees tend to have shallow roots to take advantage of the thin soils, while many of them seasonally alter their biochemistry to make them more resistant to freezing, called "hardening". The narrow conical shape of northern conifers, and their downward-drooping limbs, also help them shed snow. The boreal forest, or taiga, supports a relatively small range of animals due to the harshness of the climate. Canada's boreal forest includes 85 species of mammals, 130 species of fish, and an estimated 32,000 species of insects. Insects play a critical role as pollinators, decomposers, and as a part of the food web. Many nesting birds rely on them for food in the summer months. The cold winters and short summers make the taiga a challenging biome for reptiles and amphibians, which depend on environmental conditions to regulate their body temperatures, and there are only a few species in the boreal forest including red-sided garter snake, common European adder, blue-spotted salamander, northern two-lined salamander, Siberian salamander, wood frog, northern leopard frog, boreal chorus frog, American toad, and Canadian toad. Most hibernate underground in winter. Fish of the taiga must be able to withstand cold water conditions and be able to adapt to life under ice-covered water. Species in the taiga include Alaska blackfish, northern pike, walleye, longnose sucker, white sucker, various species of cisco, lake whitefish, round whitefish, pygmy whitefish, Arctic lamprey, various grayling species, brook trout (including sea-run brook trout in the Hudson Bay area), chum salmon, Siberian taimen, lenok and lake chub. The taiga is home to a number of large herbivorous mammals, such as moose and reindeer/caribou. Some areas of the more southern closed boreal forest also have populations of other deer species such as the elk (wapiti) and roe deer. The largest animal in the taiga is the wood bison, found in northern Canada, Alaska and has been newly introduced into the Russian far-east. Small mammals of the Taiga biome include rodent species including beaver, squirrel, North American porcupine and vole, as well as a small number of lagomorph species such as snowshoe hare and mountain hare. These species have adapted to survive the harsh winters in their native ranges. Some larger mammals, such as bears, eat heartily during the summer in order to gain weight, and then go into hibernation during the winter. Other animals have adapted layers of fur or feathers to insulate them from the cold. Predatory mammals of the taiga must be adapted to travel long distances in search of scattered prey or be able to supplement their diet with vegetation or other forms of food (such as raccoons). Mammalian predators of the taiga include Canada lynx, Eurasian lynx, stoat, Siberian weasel, least weasel, sable, American marten, North American river otter, European otter, American mink, wolverine, Asian badger, fisher, gray wolf, coyote, red fox, brown bear, American black bear, Asiatic black bear, polar bear (only small areas at the taiga – tundra ecotone) and Siberian tiger. More than 300 species of birds have their nesting grounds in the taiga. Siberian thrush, white-throated sparrow, and black-throated green warbler migrate to this habitat to take advantage of the long summer days and abundance of insects found around the numerous bogs and lakes. Of the 300 species of birds that summer in the taiga only 30 stay for the winter. These are either carrion-feeding or large raptors that can take live mammal prey, including golden eagle, rough-legged buzzard (also known as the rough-legged hawk), and raven, or else seed-eating birds, including several species of grouse and crossbills. Fire has been one of the most important factors shaping the composition and development of boreal forest stands (Rowe 1955); it is the dominant stand-renewing disturbance through much of the Canadian boreal forest (Amiro et al. 2001). The fire history that characterizes an ecosystem is its fire regime, which has 3 elements: (1) fire type and intensity (e.g., crown fires, severe surface fires, and light surface fires), (2) size of typical fires of significance, and (3) frequency or return intervals for specific land units (Heinselman 1981). The average time within a fire regime to burn an area equivalent to the total area of an ecosystem is its fire rotation (Heinselman 1973) or fire cycle (Van Wagner 1978). However, as Heinselman (1981) noted, each physiographic site tends to have its own return interval, so that some areas are skipped for long periods, while others might burn two-times or more often during a nominal fire rotation. The dominant fire regime in the boreal forest is high-intensity crown fires or severe surface fires of very large size, often more than 10,000 ha, and sometimes more than 400,000 ha (Heinselman 1981). Such fires kill entire stands. 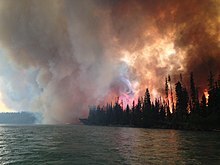 Fire rotations in the drier regions of western Canada and Alaska average 50–100 years, shorter than in the moister climates of eastern Canada, where they may average 200 years or more. Fire cycles also tend to be long near the tree line in the subarctic spruce-lichen woodlands. The longest cycles, possibly 300 years, probably occur in the western boreal in floodplain white spruce (Heinselman 1981). Amiro et al. (2001) calculated the mean fire cycle for the period 1980 to 1999 in the Canadian boreal forest (including taiga) at 126 years. Increased fire activity has been predicted for western Canada, but parts of eastern Canada may experience less fire in future because of greater precipitation in a warmer climate (Flannigan et al. 1998). The mature boreal forest pattern in the south shows balsam fir dominant on well-drained sites in eastern Canada changing centrally and westward to a prominence of white spruce, with black spruce and tamarack forming the forests on peats, and with jack pine usually present on dry sites except in the extreme east, where it is absent (Rowe and Scotter 1973). The effects of fires are inextricably woven into the patterns of vegetation on the landscape, which in the east favour black spruce, paper birch, and jack pine over balsam fir, and in the west give the advantage to aspen, jack pine, black spruce, and birch over white spruce. Many investigators have reported the ubiquity of charcoal under the forest floor and in the upper soil profile, e.g., La Roi (1967). Charcoal in soils provided Bryson et al. (1965) with clues about the forest history of an area 280 km north of the then current tree line at Ennadai Lake, District Keewatin, Northwest Territories. Two lines of evidence support the thesis that fire has always been an integral factor in the boreal forest: (1) direct, eye-witness accounts and forest-fire statistics, and (2) indirect, circumstantial evidence based on the effects of fire, as well as on persisting indicators (Rowe and Scotter 1973). The patchwork mosaic of forest stands in the boreal forest, typically with abrupt, irregular boundaries circumscribing homogenous stands, is indirect but compelling testimony to the role of fire in shaping the forest. The fact is that most boreal forest stands are less than 100 years old, and only in the rather few areas that have escaped burning are there stands of white spruce older than 250 years (Rowe and Scotter 1973). The prevalence of fire-adaptive morphologic and reproductive characteristics of many boreal plant species is further evidence pointing to a long and intimate association with fire. Seven of the ten most common trees in the boreal forest—jack pine, lodgepole pine, aspen, balsam poplar (Populus balsamifera), paper birch, tamarack, black spruce—can be classed as pioneers in their adaptations for rapid invasion of open areas. White spruce shows some pioneering abilities, too, but is less able than black spruce and the pines to disperse seed at all seasons. Only balsam fir and alpine fir seem to be poorly adapted to reproduce after fire, as their cones disintegrate at maturity, leaving no seed in the crowns. The oldest forests in the northwest boreal region, some older than 300 years, are of white spruce occurring as pure stands on moist floodplains (Rowe 1970). Here, the frequency of fire is much less than on adjacent uplands dominated by pine, black spruce and aspen. In contrast, in the Cordilleran region, fire is most frequent in the valley bottoms, decreasing upward, as shown by a mosaic of young pioneer pine and broadleaf stands below, and older spruce–fir on the slopes above (Rowe and Scotter 1973). Without fire, the boreal forest would become more and more homogeneous, with the long-lived white spruce gradually replacing pine, aspen, balsam poplar, and birch, and perhaps even black spruce, except on the peatlands (Raup and Denny 1950). Large areas of Siberia's taiga have been harvested for lumber since the collapse of the Soviet Union. Previously, the forest was protected by the restrictions of the Soviet Forest Ministry, but with the collapse of the Union, the restrictions regarding trade with Western nations have vanished. Trees are easy to harvest and sell well, so loggers have begun harvesting Russian taiga evergreen trees for sale to nations previously forbidden by Soviet law. Some of the larger cities situated in this biome are Murmansk, Arkhangelsk, Yakutsk, Anchorage, Yellowknife, Tromsø, Luleå, and Oulu. During the last quarter of the twentieth century, the zone of latitude occupied by the boreal forest experienced some of the greatest temperature increases on Earth. Winter temperatures have increased more than summer temperatures. The number of days with extremely cold temperatures (e.g., −20 to −40 °C (−4 to −40 °F) has decreased irregularly but systematically in nearly all the boreal region, allowing better survival for tree-damaging insects. In summer, the daily low temperature has increased more than the daily high temperature. In Fairbanks, Alaska, the length of the frost-free season has increased from 60–90 days in the early twentieth century to about 120 days a century later. Summer warming has been shown to increase water stress and reduce tree growth in dry areas of the southern boreal forest in central Alaska, western Canada and portions of far eastern Russia. Precipitation is relatively abundant in Scandinavia, Finland, northwest Russia and eastern Canada, where a longer growth season (i.e. the period when sap flow is not impeded by frozen water) accelerate tree growth. As a consequence of this warming trend, the warmer parts of the boreal forests are susceptible to replacement by grassland, parkland or temperate forest. In Siberia, the taiga is converting from predominantly needle-shedding larch trees to evergreen conifers in response to a warming climate. This is likely to further accelerate warming, as the evergreen trees will absorb more of the sun's rays. Given the vast size of the area, such a change has the potential to affect areas well outside of the region. In much of the boreal forest in Alaska, the growth of white spruce trees are stunted by unusually warm summers, while trees on some of the coldest fringes of the forest are experiencing faster growth than previously. Lack of moisture in the warmer summers are also stressing the birch trees of central Alaska. Recent years have seen outbreaks of insect pests in forest-destroying plagues: the spruce-bark beetle (Dendroctonus rufipennis) in Yukon and Alaska; the mountain pine beetle in British Columbia; the aspen-leaf miner; the larch sawfly; the spruce budworm (Choristoneura fumiferana); the spruce coneworm. The effect of sulphur dioxide on woody boreal forest species was investigated by Addison et al. (1984), who exposed plants growing on native soils and tailings to 15.2 μmol/m3 (0.34 ppm) of SO2 on CO2 assimilation rate (NAR). The Canadian maximum acceptable limit for atmospheric SO2 is 0.34 ppm. Fumigation with SO2 significantly reduced NAR in all species and produced visible symptoms of injury in 2–20 days. The decrease in NAR of deciduous species (trembling aspen [Populus tremuloides], willow [Salix], green alder [Alnus viridis], and white birch [Betula papyrifera]) was significantly more rapid than of conifers (white spruce, black spruce [Picea mariana], and jack pine [Pinus banksiana]) or an evergreen angiosperm (Labrador tea) growing on a fertilized Brunisol. These metabolic and visible injury responses seemed to be related to the differences in S uptake owing in part to higher gas exchange rates for deciduous species than for conifers. Conifers growing in oil sands tailings responded to SO2 with a significantly more rapid decrease in NAR compared with those growing in the Brunisol, perhaps because of predisposing toxic material in the tailings. However, sulphur uptake and visible symptom development did not differ between conifers growing on the 2 substrates. Acidification of precipitation by anthropogenic, acid-forming emissions has been associated with damage to vegetation and reduced forest productivity, but 2-year-old white spruce that were subjected to simulated acid rain (at pH 4.6, 3.6, and 2.6) applied weekly for 7 weeks incurred no statistically significant (P 0.05) reduction in growth during the experiment compared with the background control (pH 5.6) (Abouguendia and Baschak 1987). However, symptoms of injury were observed in all treatments, the number of plants and the number of needles affected increased with increasing rain acidity and with time. Scherbatskoy and Klein (1983) found no significant effect of chlorophyll concentration in white spruce at pH 4.3 and 2.8, but Abouguendia and Baschak (1987) found a significant reduction in white spruce at pH 2.6, while the foliar sulphur content significantly greater at pH 2.6 than any of the other treatments. Many nations are taking direct steps to protect the ecology of the taiga by prohibiting logging, mining, oil and gas production, and other forms of development. In February 2010 the Canadian government established protection for 13,000 square kilometres of boreal forest by creating a new 10,700-square-kilometre park reserve in the Mealy Mountains area of eastern Canada and a 3,000-square-kilometre waterway provincial park that follows alongside the Eagle River from headwaters to sea. Two Canadian provincial governments, Ontario and Quebec, introduced measures in 2008 that would protect at least half of their northern boreal forest. Although both provinces admitted it will take years to plan, work with Aboriginal and local communities and ultimately map out precise boundaries of the areas off-limits to development, the measures are expected to create some of the largest protected areas networks in the world once completed. Both announcements came the following year after a letter signed by 1,500 scientists called on political leaders to protect at least half of the boreal forest. The taiga stores enormous quantities of carbon, more than the world's temperate and tropical forests combined, much of it in wetlands and peatland. In fact, current estimates place boreal forests as storing twice as much carbon per unit area as tropical forests. One of the biggest areas of research and a topic still full of unsolved questions is the recurring disturbance of fire and the role it plays in propagating the lichen woodland. The phenomenon of wildfire by lightning strike is the primary determinant of understory vegetation and because of this, it is considered to be the predominant force behind community and ecosystem properties in the lichen woodland. The significance of fire is clearly evident when one considers that understory vegetation influences tree seedling germination in the short term and decomposition of biomass and nutrient availability in the long term. The recurrent cycle of large, damaging fire occurs approximately every 70 to 100 years. Understanding the dynamics of this ecosystem is entangled with discovering the successional paths that the vegetation exhibits after a fire. Trees, shrubs, and lichens all recover from fire-induced damage through vegetative reproduction as well as invasion by propagules. Seeds that have fallen and become buried provide little help in re-establishment of a species. The reappearance of lichens is reasoned to occur because of varying conditions and light/nutrient availability in each different microstate. Several different studies have been done that have led to the formation of the theory that post-fire development can be propagated by any of four pathways: self replacement, species-dominance relay, species replacement, or gap-phase self replacement. Self replacement is simply the re-establishment of the pre-fire dominant species. Species-dominance relay is a sequential attempt of tree species to establish dominance in the canopy. Species replacement is when fires occur in sufficient frequency to interrupt species dominance relay. Gap-Phase Self-Replacement is the least common and so far has only been documented in Western Canada. It is a self replacement of the surviving species into the canopy gaps after a fire kills another species. The particular pathway taken after a fire disturbance depends on how the landscape is able to support trees as well as fire frequency. Fire frequency has a large role in shaping the original inception of the lower forest line of the lichen woodland taiga. It has been hypothesized by Serge Payette that the spruce-moss forest ecosystem was changed into the lichen woodland biome due to the initiation of two compounded strong disturbances: large fire and the appearance and attack of the spruce budworm. The spruce budworm is a deadly insect to the spruce populations in the southern regions of the taiga. J.P. Jasinski confirmed this theory five years later stating “Their [lichen woodlands] persistence, along with their previous moss forest histories and current occurrence adjacent to closed moss forests, indicate that they are an alternative stable state to the spruce–moss forests”. ^ Sporrong, Ulf (2003). "The Scandinavian landscape and its resources". In Helle, Knut (ed.). The Cambridge History of Scandinavia. Cambridge University Press. p. 22. ^ Wilmking, M. (2009-10-09). "Coincidence and Contradiction in the Warming Boreal Forest". Geophysical Research Letters. 32 (15). Bibcode:2005GeoRL..3215715W. doi:10.1029/2005GL023331. Retrieved 2012-01-14. ^ Shuman, Jacquelyn Kremper; Shugart, Herman Henry; O'Halloran, Thomas Liam (2011-03-25). "Russian boreal forests undergoing vegetation change, study shows". Global Change Biology. 17 (7): 2370–2384. Bibcode:2011GCBio..17.2370S. doi:10.1111/j.1365-2486.2011.02417.x. Retrieved 2012-01-14. ^ Ruckstuhl, K. E.; Johnson, E. A.; Miyanishi, K. (July 2008). "Boreal forest and global change". Philos. Trans. R. Soc. Lond. B Biol. Sci. 363 (1501): 2245–9. doi:10.1098/rstb.2007.2196. PMC 2387060. PMID 18006417. This page was last edited on 18 April 2019, at 00:46 (UTC).